Mariscal Canyon in Big Bend is one of the most remote places in Texas. The trek to arrive at this amazing location is involved and lengthy. To shoot at this location, I had to rent a jeep – the only jeep available within 100 miles – in Terlingua. From there, I drove around to River Road East and methodically plowed over 30 miles of grinding 4WD road, and the last 6 miles resembled more a pasture with lots of grass rather than an actual road. After almost two hours of bumping along in the jeep, the path to the rim of this canyon took me 3.5 miles over vast, empty desert terrain. While there is a trailhead that marks the end of the road the beginning of the hike, there really isn’t a well-defined trail, but more a series of rock cairns leading you along. From rock pile to rock pike, the first two miles is relatively flat, only rising and falling through several washes. However, the last third of the hike leads up about 1200 vertical feet. After a lot of grunt work, you reach a rolling plateau of cacti and scrub brush. To the right are the sheer cliffs of Mariscal Canyon that drop 1200 feet to the meandering Rio Grande. Across the chasm is Mexico. To enjoy sunset here was one of the highlights of my photography and hiking career. The hike back was a bit of a different story. Searching for the next cairn for 3+ miles was challenging and tedious, but finally the jeep glowed in the light of my flashlight. Along the way, I encountered big horn sheep, tarantulas, lizards, and even a pack of javelinas. It was an evening to remember. 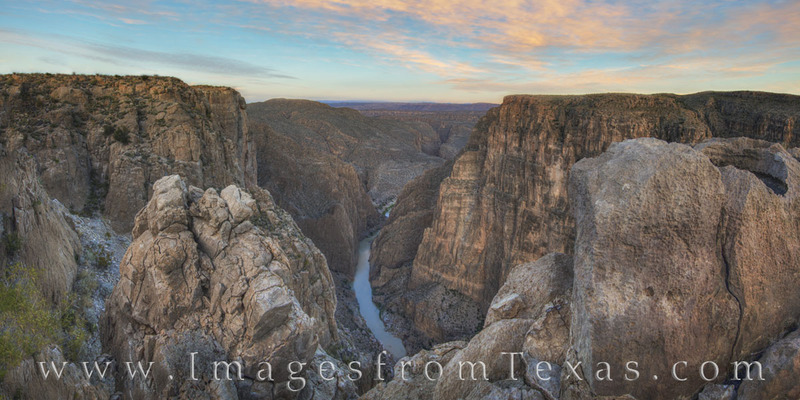 This panorama from Big Bend is available in custom and larger sizes. Please contact me for specific needs.